W&OD Railroad Crossing at Columbia Pike near Four Mile Run. You, the viewer are looking East on Columbia Pike. 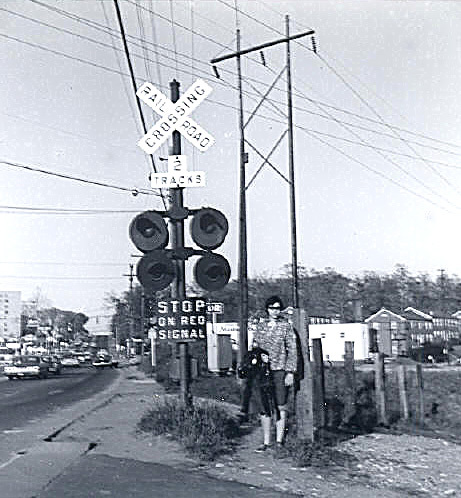 This picture of Ace in 1964, standing at the RR Crossing at 4 Mile Run was taken across the street from the previous picture. Notice that there are no sidewalks. The white building further behind me is now the Goodwill shop. Those garden apartments (on the viewer's right) are still standing today. when the W&OD train came thru.